With queues around the block for Boho Gelato and Gelato Gusto, plus the arrival of the brilliant Brass Monkey on Kensington Gardens, artisan ice cream is Brighton’s cool food trend. Yep, regular ice cream flavours are just so… vanilla these days. 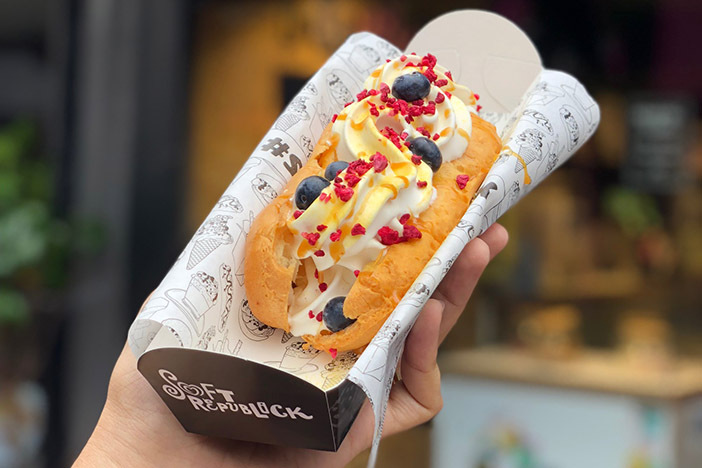 Soft serve parlour Soft Republick takes ice cream creativity to a new level — although it could be a level too far for some dessert devotees. “Championing self-expression using ice cream as a blank canvas,” is how they describe their aesthetic. Confused? Well, for example, customers can conceive their own Turner Prize effort in the form of a Graffiti Cone, by decorating it with “ChocSprays” from a spray gun. Talk about ephemeral art. They also offer Soft Dogs. Yep… that’s an ice cream hot dog (pictured above). Guaranteed to increase your heart rate to the level of a terrified chihuahua* (*actually not guaranteed). Prices range from £2 for a Naked Cone to £3 for a Graffiti Cone and £4 for a Takeaway Box. Soft Republick is at 13 Duke Street, Brighton BN1 1AH. They also have vans at Churchill Square and outside Brighton Station.